A short week because of a few days walking in the Lakes between Christmas and New Year but with a total of about 9000 feet of climbing it hasn't been a bad one. As before, I am not completely sure about including walking miles/feet and I am interested in your thoughts. I still think excluding walking miles is right and including the climbing not least when it is in the Lakes where I would have walked anyway (had I been out of a run) and it usually involves carrying more weight. Let me know what you think. Last night's hill session was encouraging, albeit at the end of a short week, because I managed a PB on the last rep of the session. 0.65 mile uphill in 5:05 - my previous best was 5:08 and a year ago 5:10 - 5:12 was more likely. The target now has to be to get under 5 minutes without 'resting' on the previous reps.
On Saturday we will join members of The Rucksack Club (as guests) on their first meet of the year, the annual Marston-Edale walk. Sunday will have to be my long run and unusually it won't follow a rest day so that should be interesting. 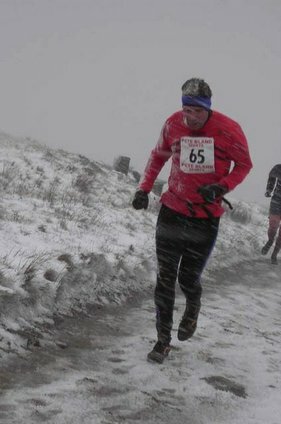 Club training will be back to normal and I intend to continue with track and hill sessions because it is not enough to only do long slow runs. I can see the logic especially for long walks and where the climbs are sustained - I suppose I would prefer to understate the mileage and have the benefit rather than adding in all the miles and feeling I could ease off a bit.